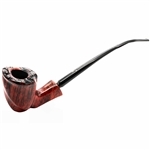 Brown Marble Rhodesian Briar Pipe - Half Bent - Made in St. Claude, France. It is a beautiful piece that you will enjoy for years to come. The stem is made of Vulcanite for good looks and long lasting durability. 100% satisfaction guaranteed. The briar pipes are boxed with a soft black drawstring pouch.